Do 1031 Exchange Rules Allow Purchase Of Investment Automobiles? No doubt 1031 exchange rules are complex. Sometimes that leaves investors wondering about what their options are for investments that qualify. In this episode, David explains that, for example, investment automobiles are qualified investments under 1031 exchange rules. Patrick: Today we’re talking with David Moore, co-founder of Equity Advantage, a firm that specializes in tax deferred investments, in particular IRS Section 1031 exchanges. David, I know that there are a lot of 1031 exchange rules. How do 1031 exchange rules apply to investment automobiles? Can you purchase cars in a 1031 exchange? David Moore: It’s a good thing you ask, because typically people think of real estate when they think of section 1031 exchanges. In reality it applies to anything that could be held in productive use: trade, business, or for investments. In today’s world, there’s lots of people looking for what I call REAL investments. If it’s not stocks and bonds, Wall Street considers it an alternative investment. We’re doing a fair number of car transactions these days. It’s actually fun since I’m a car guy. Why would someone want to invest these funds in an automobile? David Moore: It’s really just a question of investment. When you’re looking at the rules in 1031, the only thing that changes when we apply 1031 to a car, for example, compared to a real property, is the like-kind definition changes. When we talk about a 1031 exchange with the application of real property, it refers to the nature of the investment. You can go from land into apartment buildings and rental houses, so on and so forth. When we’re talking about a car, it’s got to match up with another car. You couldn’t go from a car to cattle let’s say, even though we do cattle exchanges. Like-kind wouldn’t even apply to cows and bulls in that scenario. Today people are looking for things, hard assets, things that they can see and look at, something that can’t just go away. Typically, you’re looking at precious metals let’s say. Art throughout history has been a great investment. People are looking to cars today because it’s got a lower threshold to get in and yet the high end are getting higher and higher and higher every year. 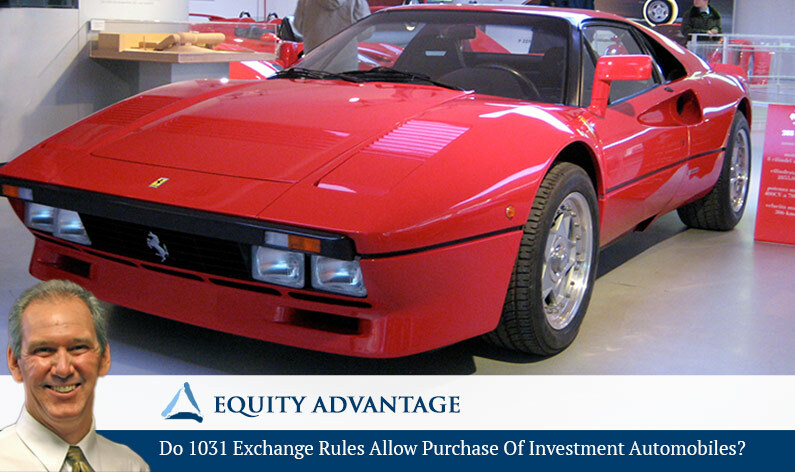 You have a story about a client that invested in a Ferrari using 1031 exchange rules. Can you share that with us? David Moore: Actually, we’ve got a current transaction we’re just working on right now where a gentleman’s got two Ferrari’s and a Porsche. He’s got a Ferrari 288 GTO, which is a very limited addition, great car, wonderful car. A Ferrari FXX which was originally built for track use, but it’s the second piece of this exchange. The third car on the relinquish side is a Porsche GT3RS 4.0 which is roughly a half-million dollar Porsche. That car went just from a couple hundred thousand dollars to almost a half-million in just a year or two. That’s why people are doing it. But all three of those cars are being exchanged for a half-interest in another car. That half-interest in the replacement car is a McLaren F1 which he’s just taking … The gentleman that’s giving up the other three cars owns the other half of it, so he’s exchanging the other half of the McLaren so he’ll own the entire McLaren. But the half-interest we’re taking those three cars into is six million dollars. That’s sort of an extreme exchange, but that’s an example. We’ve got another transaction where we’re exchanging a couple of Camaro race cars right now. That’s the more down to earth price point, but it’s still a neat transaction. Patrick: Well thank you David. Listeners may call 503-635-1031 or can visit 1031exchange.com for more information. Experts like David Moore help clients cut through the confusion of 1031 exchange rules to find investments that qualify and meet their personal financial goals. Follow our series of blogcasts to learn more about 1031 exchanges.